There’s a wealth of knowledge to gather when thinking about nutrition for your ducks. One surprise for us right out of the gate, was we noticed these little guys REALLY put the groceries away. A feed that has worked great for us is Nutrena Nature Wise 18% Non-Medicated Chick Feed, free choice, meaning as much as they want. We also supplement with vitamins, electrolytes, and brewers yeast for birds. Baby chicken feed does not have quite enough Niacin for ducks as they can have leg issues if not given enough. This was the reason for the additional supplements. It’s important to note, you do NOT want to use medicated chick feed, as the medication Amprolium is not approved for waterfowl. Our ducklings will stay on this starter for about 6 weeks, then we will switch them over to a 16-18% Layer Feed. Most waterfowl breeders recommend not exceeding 18% protein to avoid a condition called angel wing. Many also like to dilute the feed with some scratch or oats. Additionally, it’s recommended to continue to supplement with brewers yeast. As with any birds, water access is important. I was reminded how much ducks love/need to keep the mucous membranes in their nostrils wet at all times, hence the continual mess in and around the water bowl. This serves as a great reminder to not try to brood baby chicks with ducklings. 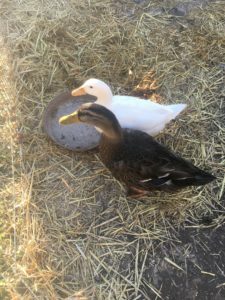 Changing out water often and allowing an absorbent surface for the waterers are very helpful tip for new duck owners.